Interested in having a printed, custom, branded and logo’d map for your store? Become part of our reseller program and we’ll design a one-of-a-kind map that your customers will love. Event maps are great marketing tools for participants and visitors alike. Let us build a custom event map that highlights your routes and points of interest, and can even be GPS-enabled on smartphones! Don’t need a printed map? We also offer digital map or poster design services, giving you the flexibility to choose how to use the finished product. How will you help design a custom map for my business or event? Tired of outdated paper maps without enough detail for the area you’ll be exploring? To ensure that all OffTheGridMaps show you what you need for your next adventure, we start by collecting the best available data sources of public and private lands, waterbodies, transportation, terrain, and more. Then we overlay a comprehensive set of recreation-based points of interest like fishing access, boat launches, campgrounds, and hiking trails. Finally, we thoughtfully color-code and shade each layer, resulting in highly detailed and easily readable maps. When you’re deep in the woods, it’s comforting to know your map won’t run low on batteries. In addition to our design services, OffTheGridMaps also offers high-quality printed maps for retail sales and special events. Whether you are a fly fishing guide who wants to show customers where the river put-in’s and take-outs are, a cycling shop who wants to highlight the best nearby trails, or you’re hosting an annual event, OffTheGridMaps is your one-stop shop for high-quality map design and print services. Want to find your exact location on your custom map? Now you can with our GPS-enabled smartphone companion maps! Let’s face it… we now take our cell phones with us just about everywhere, so why wouldn’t you want to take your GPS-enabled smartphone maps with you, too. In addition to print maps, OffTheGridMaps digital companion maps use your phone’s built-in GPS to pinpoint your exact location on your digital map, even without cell service! Now you can rest assured that knowing that you’re on the right path, even where there isn’t one. Please contact us if you have any questions about how we can help your organization. Are you an industry pro? We've got a deal for you! Are you an Outdoor Professional, working in the hunting, fishing, hiking, biking, winter sports, or conservation industry? As a special thank you for helping improve and to promote OffTheGridMaps, we offer outdoor industry professional up to 40% discount on published digital maps in our map store. Just contact us or send an email with your name, email address, and place of business and we’ll set you up with a special Coupon Code that you can use at the time of checkout. We look forward to working with you! OffTheGridMaps.com was started by Ryan Dalton, a professional cartographer living in Whitefish, MT. 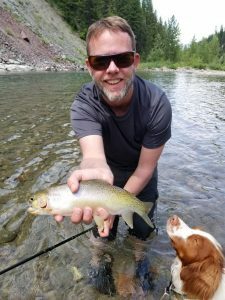 He, his wife Jane, and their faithful puppy Driggs, spend most of their weekends outdoors camping, fishing, hiking, snowboarding, cross-country skiing, visiting hot springs, or Driggs' favorite, pheasant hunting. Ryan graduated from Oregon State University with a degree in Geography, and has been working professionally with spatial (GIS) data for over 20 years. But it wasn't until he got his puppy, Driggs (an American Brittany, bred for "pointing" at upland game birds) that he started making hunting maps for personal use. The first time Ryan went bird hunting (ever... in his life! ), he realized he wanted a map that was easy-to-use, worked offline (no cell service), and GPS-enabled. Most importantly, he wanted a map with more detail that was focused just on the area(s) he was going hunting. That way he could not only see where he was, but also where he wanted to go next. Fortunately, Montana has a great history of sharing publicly available geographic (GIS) data. Being familiar with many of the sources of data throughout the state, Ryan set off on a quest to locate the best available sources of upland bird hunting map data. After compiling all of the map features into one system, it was time to start designing the map. Ryan's goal was to keep as many of the recognizable features people expect to see on a map, but break some of the rules and only include the most relevant map features in order to make OffTheGridMaps clean, crisp, and highly readable. When friends started asking for maps of areas they were traveling to next, Ryan realized there wasn't an easy way for people to get maps that were zoomed in to just the locations and showed and recreational activities that were important to them. And so began OffTheGridMaps.com. OffTheGridMaps wouldn’t be a reality without a lot of support, and not just on a personal level. While friends, family, and colleagues have played a vital role, free or inexpensive access to software and support are immensely valuable to a startup. We’d like to acknowledge those people, data sources, and software that have helped us get where we are. There’s too many to name, and if we started putting pen to paper, we’d probably miss someone. So for those of you who have provided content and layout ideas, as well as business advice, just know we are incredibly grateful for your contributions! We couldn’t have made it this far without your help! One of the best things about the GIS and mapping industry is the availability of data. Government agencies are generally the best source of spatial data, and Montana has a great culture of publicly sharing this data widely and freely. We’ve compiled a list of many of the agencies who have made their data sources publicly available, and have been integrated into OffTheGridMaps. Of course, none of this could be done without quality software. And there is some great open-source software that is freely available to the public. What are the key pieces of software we use? and so many more contributors!